...tomorrow! I've been preparing for a while now. 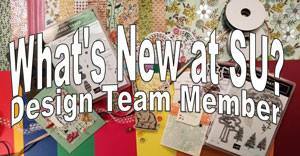 I will have some retired rubber for sale as well as some cards and some Try It Kits for My Paper Pumpkin. 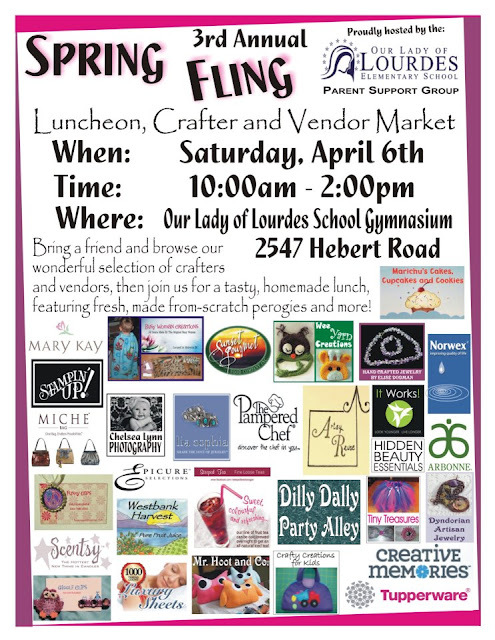 I am super happy to be going back to Our Lady of Lourdes Spring Fling because it is really where I got my start as a Stampin' Up Demonstrator. Yes, around a year ago, I had just signed up as a demo and, wet behind my ears, I was asked if I wanted to do this craft fair in place of my up line because she was too busy! 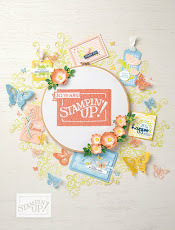 I had no clue what I was doing and I needed all her display items because I had none of my own, but the up shot was that I met some of my best customers at that fair and it was the start of my Stampin' Up career! Fond memories! Aren't these adorable? I made a visit to the Bulk Barn for their great gourmet jelly beans and then got to work filling Stampin' Up's 1" x 8" cellophane bags (which have a great self-stick closure at the top) and creating the cute tags for them. I used the Owl Builder Punch (SO versatile) to make the chicks along with the Boho Blossoms punch for their little top-knot! The Elegant Butterfly Punch and the Bitty Butterfly punch created the three layer butterfly tags, and I used the new Pinwheel Sizzlits S Die to make the pinwheel toppers. Where you see DSP there, it is from the Sunshine and Sprinkles Series. Does anyone recognize the ribbon? I'm batting 1000 this week with retired product, but I thought the craft fair was a good place to use up a some stuff I still had hanging around! Leave me a comment with your name and email info if you recognize the ribbon and I will enter your name in the draw to win a little treat from Stampin' Up! My other project is a fund raiser to benefit Breast Cancer Research. 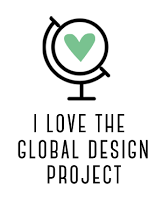 I got the design from a Pin on Pinterest, created by Amanda Frankel. Half of all the proceeds from the sale of these cards, I will donate to the BC Cancer Foundation! 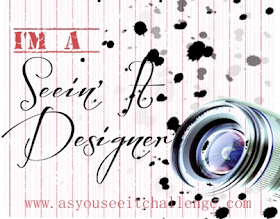 And here's another little contest for you. How did I get those bras made since I'm pretty sure Stampin' Up doesn't have a bra punch. Yet it is made with a Stampin' Up punch. Leave me a comment with the right answer and your email info and you will have your name entered in the draw for a little treat. And if you live in my area, come and see me on Saturday, April 6 from 10 am to 2 pm at Our Lady of Lourdes school gym on Hebert Road, and pick up some of my goodies! I hope to see you there. I love how you used the bottom half of the Elegant Butterfly for the bra! You used the lower segments of the elegant butterfly punch for the bra's and turned them around so that the tails of the wings became the straps for the bra's. The question has been answer -elegant butterfly , very creative & a good cause. Good for you ! Polly, you are the winner! I'll send your treat in the mail!